The last step in the server wizard presents the full configuration and allows to further setup network, management, monitoring and deployment configuration. Click on 'Submit' to save the server configuration. You need to deactivate the browsers Pop-up Blocker for the openQRM website! 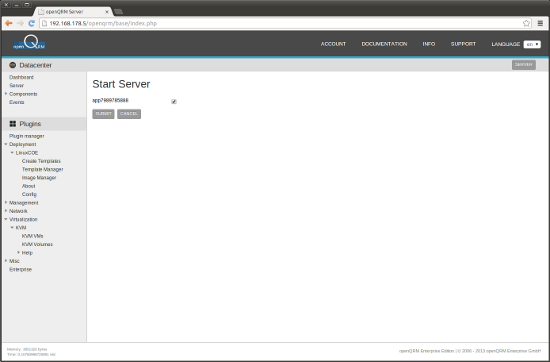 To start the automatic installation please type 'install' in the VNC console and press ENTER. 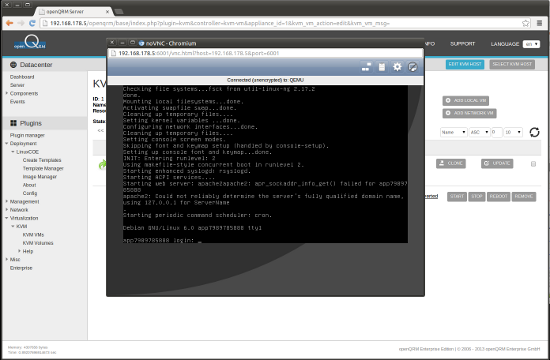 The KVM VM is now automatically installing a Debian Linux distribution. Good time for you to grab a coffee! 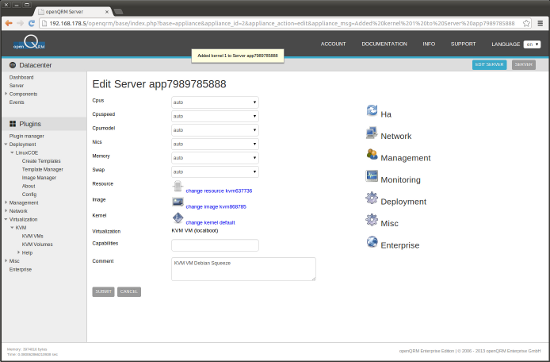 Now it is recommended to install the 'openqrm-local-vm-client' on the fresh installed system. For local-installed Virtual Machines (e.g. 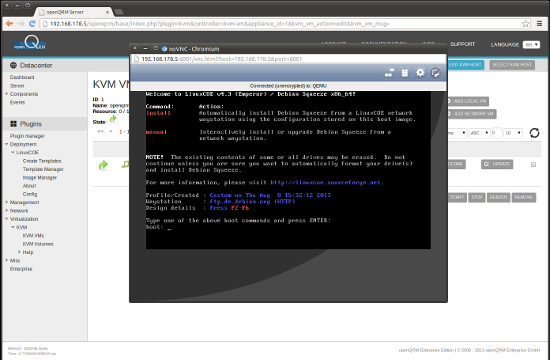 kvm(local VM), xen(local VM), lxc(local VM), openvz(local VM) which have access to the openQRM network the 'openqrm-local-vm-client' activates the plugin-client-boot-services to allow further management functionality (e.g. 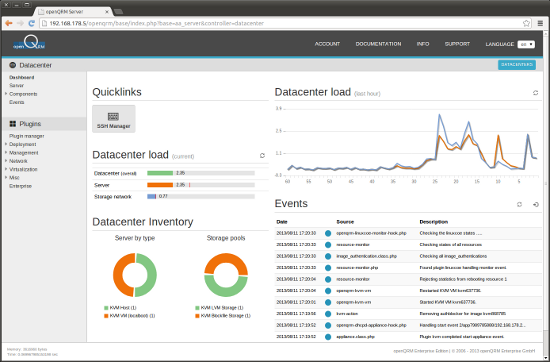 application deployment with Puppet, system statistics with Collectd etc). 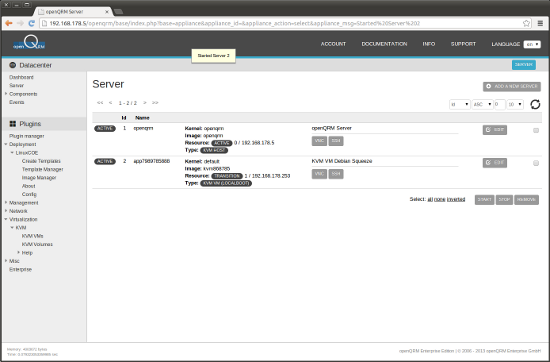 Monitoring and openQRM actions are still running on behalf of the VM Host. 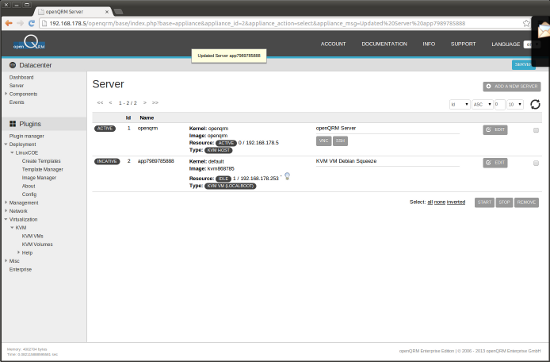 This will automatically setup the 'openqrm-local-vm-client' in the system init and start it. Go to Plugins -> Virtualization -> KVM -> KVM Volumes and select the 'openqrm-lvm' storage object. Then choose the 'kvmvg' logical volume group to get a list of all available LVM volumes. 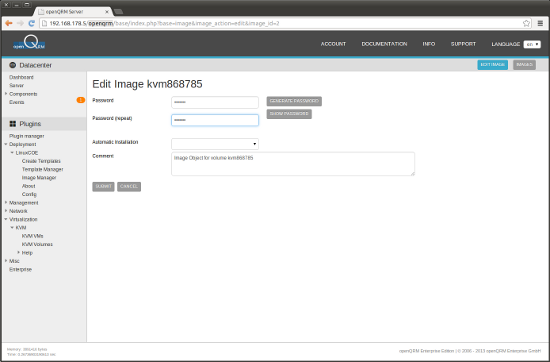 In this view you can use the 'clone' or 'snap' action to clone or snapshot existing, installed KVM LVM Volumes. The 'clone' action creates a new logical volume and copies the content of the origin over. Snaptshoting is using the "copy-on-write" mechanism of LVM which is much more efficient. Actually a deployd snapshot of a KVM LVM Volume just stores the changes compared to its origin. 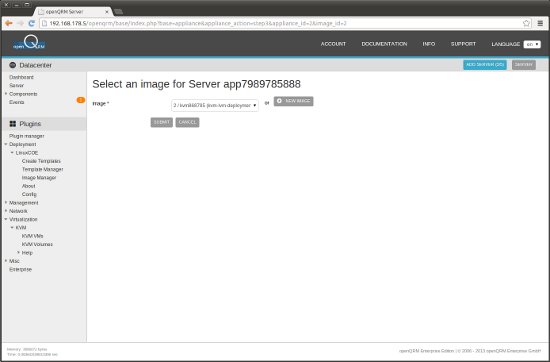 That means that creating snapshots e.g. per user allows to 'just' store the data which is different per user.